A little while ago Bronwynne Calvert from Irrewarra Bakery in Victoria contacted me about using a couple of my designs for new labels for their delicious Anzac Biscuits. I know they are delicious because, despite not living in Victoria and never having been to the Irrewarra Bakery, she sent me some sample packets. The biscuits are the large crunchy Anzac Biscuits & are so nice that they did not last long in my household full of men! (Bronwynne also sent some of their Granola – scrumptious!). ‘Hardtack Biscuits’ in WW1/Gallipoli apparently were not the lovely sweet versions we know now, but were a hard bread substitute of flat ‘wafers’ (I think ‘wafers’ is also misleading by all accounts as well – probably ‘bricks’ may have been more appropriate) – they are so ‘durable’ that the Australian War Memorial apparently still has some leftovers! By all accounts the sweet rolled oats and golden syrup ‘Anzac Biscuits’ recipe we know now, date back to about the 1920’s and are a favourite Australian biscuit recipe. I think they were a staple family biscuit/recipe since that time and are popular amongst the Country Women’s Association – CWA. Quick and simple and not needing any eggs, I know I have made them for years for my ‘boys’. You can find out about the history of the Anzac Biscuit at the Australian War Memorial, I particularly like the reference in this article to ‘other uses’ many soldiers came up with for the original ‘hardtack biscuits’ – including artists using them as ‘canvases’ to paint pictures on. One can only imagine! If you feel really motivated you can even make your own ‘Hardtack biscuits’ from the AWM recipe here. 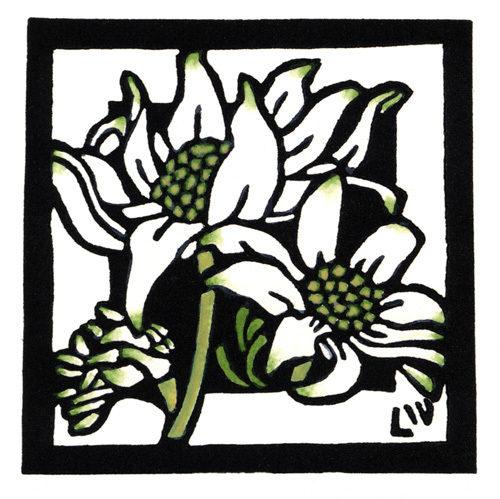 Anyway back to the new labels using two of my linocut designs. I have not done a lot of licensing of my artwork for products and am careful about how much and where my artwork is used but I simply could not resist this small bakery with its gorgeous produce. The two designs she chose were a Mini Flannel Flowers and Mini Waratah. 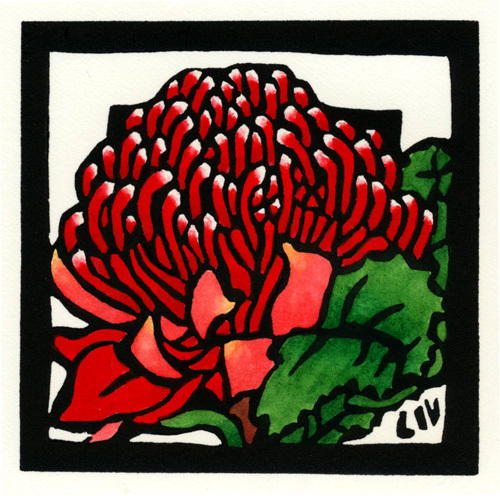 I mentioned a while back the difficulties I had with the lino and re-printing the Mini Waratah but am very pleased with the newly carved clean and crisp linoblock and prints now. It was well worth the effort of re-carving this design. Well I got an email from Bronwynne yesterday saying that the labels are all completed and on the packets of Anzac Biscuits and are being delivered to their suppliers today!! Here the pictures of the new packaging below! Whoo hoo!! How exciting! Irrewarra Bakery sourdough breads look amazing – just wishing i could pop down the road & buy some of their bread for lunch! For the places to find their products here is the list of Stockists. I think they’ve come up rather well and in time for Anzac Day on 25th April. Oh and Bronwynne said she is sending more samples with the new label – looking forward to that parcel!! Congrats on the package design license! The old-fashioned typeface matches very well with your crisp linocut images. Thanks Lorraine – will be looking for Irrewarre bread when I go to Melbourne – hope to get up the the bakery as well.